According to a 2013 article from ESPN The Magazine, approximately 21.5 million kids between the ages of 6 and 17 will participate in a team sport each year. As a former youth football and baseball coach and current father of two girls between the ages of 2 and 7, this number couldn’t be high enough. The enormous benefits of competitive sports are too long to list, but suffice it to say that every child walks away from this experience armed with a set of skills that will serve them well in future sports, and more importantly, in life. A few years ago, my daughter participated in her first competitive sports opportunity, a local YMCA soccer team. Each week as I watched her practice and play in games, I quietly celebrated the physical and mental maturation that I was witnessing. Although she was often confused as to where she should be on the field or when she should kick the ball, it warmed my heart to know that she was simply playing the game. Today, as my daughter nears the age where the high stakes nature of competitive sports is ever-present, I can’t help but think of a new game she will be playing, which often goes unnoticed by parents and coaches. No, I’m not talking about a particular sport. I’m referring to what I call The Game Within The Game. Let me explain by sharing a personal story. The year was 1987 and I had just received the news that I was the only Sophomore to make the Varsity Football team. As I walked into the house following practice, I shared the news with my two biggest fans, my parents. As you might expect, they were both elated and quickly asked, “How do you feel?” Expecting me to mirror their joy, the answer they got was far from joyful. “I don’t know if I want to be on the Varsity team. I don’t think I’m good enough.” The tears that followed were a symptom of a much bigger game, which I was clearly losing. Sure I was good enough to excel at the game of football. What I was lacking, however, was the ability to master the game within the game; the mental game. While my athletic ability warranted the potential to win on the field, my lack of self-confidence was causing me to lose in my mind. Aside from my parents, I often kept these thoughts and emotions to myself. After all, a macho high school quarterback isn’t allowed to be vulnerable. I was supposed to be the leader that had it all together. The many masks I wore in an effort to uphold the confident quarterback image were successful in the short-term. However, in the long-term, I continued to battle with the mental game. Having said all of this, I’d like to share two critical skills that ALL athletes must possess in order to be successful, on and off the field. Athletic ability alone is not enough. #1 – They must possess the skill of self-awareness. I remember my parents asking me why I didn’t believe in myself and my answer was always, “I don’t know.” You see, I just assumed that my brain was wired to think like this. It was the classic, “That’s just the way I am” response. The skill of self-awareness allows you to practice metacognition. Simply put, it’s your ability to think about your thinking. Every athlete possesses negative thoughts, which can hinder their performance. As coaches, however, it’s easy to look past the power of an athlete’s thoughts and expect them to simply perform. Unfortunately, young people are conditioned to mask their thoughts and feelings for fear of being perceived as weak. If we simply expect them to show up and perform, without teaching them the skill of self-awareness, we are overlooking the game within the game. #2 – They must possess the skill of emotional management. If I sat down with a group of high school athletes and informed them that we were going to talk about their emotions, I’m guessing that their collective groan would be loud enough to wake a bear in hibernation. If you have a teen, or work with teens, then you know that talking about emotions is extremely low on the cool meter. So, rather than beginning a presentation by telling them we’re going to talk about emotions, I make a simple request. “Please raise your hand if you ever experience emotions such as anger or worry.” Other than those who are in denial, the majority of the hands go up. While this simple request may not make conversations about emotions more appealing on the cool meter, it does begin to break down a huge barrier. Let’s face it, there is nothing you do can to escape the fact that you are an emotional being. We ALL have emotions and we are ALL influenced by them. As an athlete, you have two choices: let the emotions control you or learn to control your emotions. When you learn to do the latter, your game on the field will drastically improve. If we simply expect them to show up and perform, without teaching them the skill of emotional management, we are overlooking the game within the game. 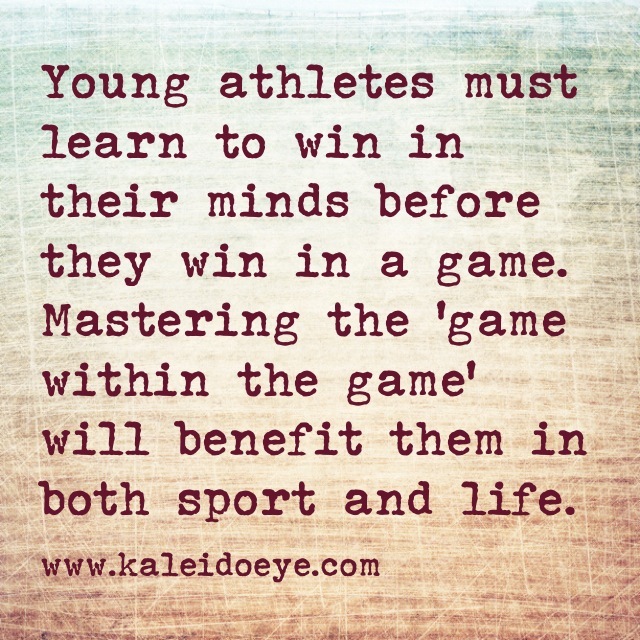 If you’d like to learn more about how I empower athletes (and parents) to cultivate these skills, please email me at mike@kaleidoeye.com. Wow, you hit the nail on the head! Of course, and now I want to know how to teach both of my kids these skills. It not an easy skill to teach. I learned by accident I think. No one taught me, it just came along in the process of life, but I happened to be very self aware just naturally, but my kids don’t seem to have it and I need help teaching it to them for sure. Now that I think about it, I attended a seminar in the 90’s, called Landmark Forum and that seminar changed my life. It taught me many of the skills you are talking about, plus setting me free my filter. I put my kids through that course when they were 9 & 10, but I suspect they were not old enough. As a parent, I need to know how to teach them on a daily basis and help keep their minds thinking the right thoughts. Thanks so much Mike for being in the forefront, of this challenge to help our next generation succeed! Thank you, Bradlee. Good for you for choosing to be a “guide on the side” and allowing her to “be” with the emotions. It’s easy as a parent to encourage your child to repress an emotion in the short term, which only causes longer term problems. I always say that whatever is repressed, gets expressed. I can not agree with you more that the mental game of the sport is so much more powerful than the physical game in any sport. Being a nationally ranked gymnast while I was a child I have personally experienced this mindset. As a mom of 3 beautiful boys, teaching them mental intelligence is an ongoing process. The motto in my house is to always be positive and productive and this applies to all that we do. As my boys develop into athletes I try to communicate the game within the game as you have so powerfully mentioned. Appreciate the reminder of its importance!! Thanks Mike. Thank you for your comments Jeannette. I’m glad you’ve made it a priority to discuss this with your kids. I agree that mental toughness can be a difficult concept to teach, but it’s just like strengthening a muscle, some days we experience more growth than others.